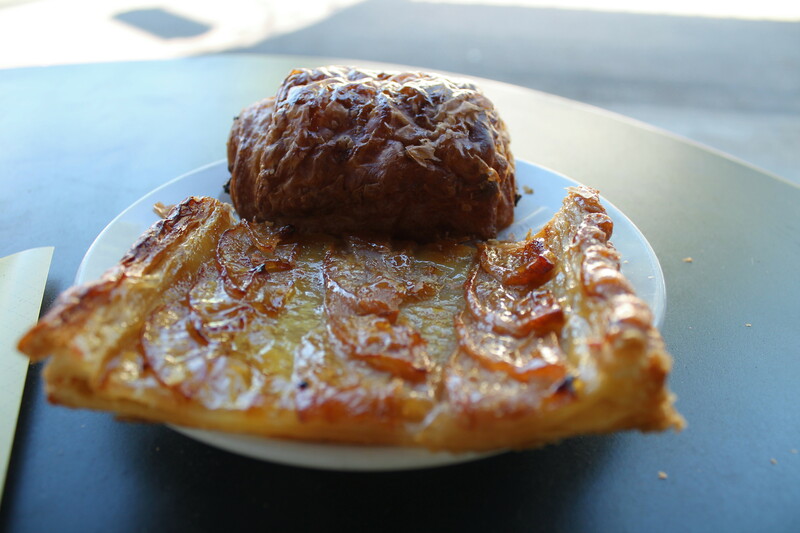 Since we’re finally settled into our new apartment, we ventured out this morning in search of second breakfast at St Honoré Boulangerie in northwest Portland. Named for the patron saint of baking, St Honoré is a classic French bakery with two locations in the metro Portland area — one in Lake Oswego and the one we visited at NW Thurman & NW 23rd in Portland’s Nob Hill neighborhood. We visited the bakery at 9:30 AM on a Sunday, and although it was fairly crowded, we were able to order our food within 5 minutes of waiting in line. 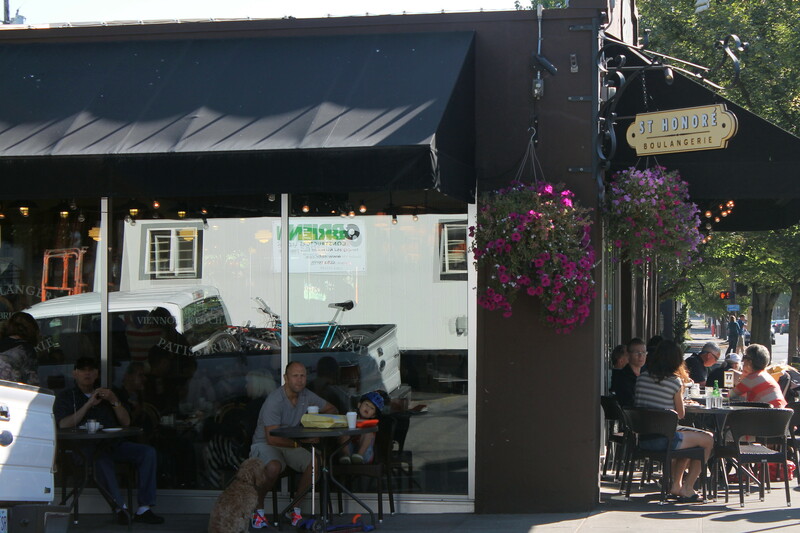 Fortunately, we were also able to score a table on their patio so we could enjoy the beautiful late summer weather. 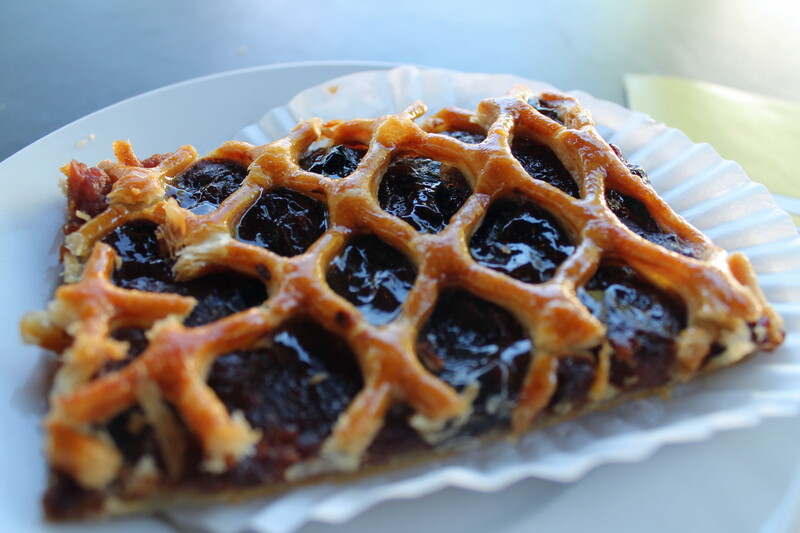 They have any extensive selection of traditional French breads such as couronne and pain de campagne, croissants, fruit tarts and other pastries, soups, salads, sandwiches and desserts. Both the tarte citron and opera cake looked tempting, but I opted for the seasonal grillé aux pommes, which featured locally grown apples from Kiyokawa Family Orchard in the Hood River Valley. The pastry had a light, buttery flavor and texture similar to a croissant, and the carmelized apple filling was not overly sweet. While it was tasty, it was served at room temperature and would have been better served slightly warm. The husband chose the tarte aux pommes fines and a traditional pain au chocolat to save for later. Apparently these apple pastries will be available through November. The apple pastries were reasonably priced at $3.90 per slice and the pain au chocolat was $2.50 — comparable to what I used to find at bakeries in Switzerland. If I come here again, I’ll definitely have to try the bread and the opera cake. This entry was posted in Oregon, Restaurant Reviews and tagged apples, bakery, bread, desserts, Oregon, pastry, Portland, restaurant reviews. Bookmark the permalink. Looks like a yummy spot!